fajny produkcik polecam, swietnie działa, pobudza możg do akcji! 1 capsule once or twice a day, during a meal. Safe and effective nootropic supplement. Absolutely recommendable especially for those who want to improve memory and speed up the process of learning. Indicated for all those looking for mental and emotional balance, because it calms and relaxes but does not cause dizziness. According to the manufacturer's instructions 1 capsule should be taken once or twice a day. Studies show that L-theanine is extremely safe and well tolerated by the body. After less than an hour after consumption goes to the brain, where for the next five hours stays on its increased level. For this reason I would suggest to spread the dose and taken with an interval of about 5-6 hours. L-theanine works very well with caffeine. It reduces irritability and nervousness, which may be caused by higher doses of caffeine results in a pleasant agitation, greater concentration and alertness. 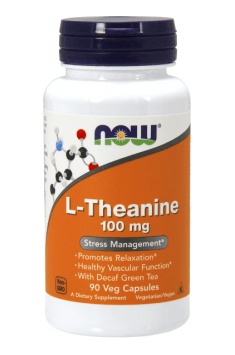 If you want to use the L-theanine to stabilize mood and improve sleep quality suggest combine it with Ashwagandha or 5-HTP. L-teaina can be used without interruption supplementation. California grape seed extract. It has a positive effect on the functions of the circulatory system.